Dutch painter, part of a family of painters. Pieter Verelst (?1618-?86) was from Antwerp and a pupil of Gerrit Dou. 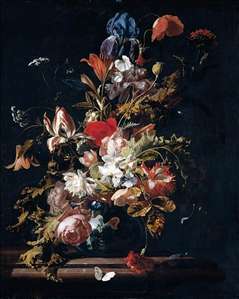 He was the father of Harman Verelst (1641/2-99), a portrait painter, and Simon Verelst, who was renowned for his flower paintings. Both brothers moved to London to practise. Harman s daughter Maria Verelst (1680-1744) followed in his footsteps and enjoyed success in England, while Harman s son Cornelis Verelst (1667-1734) was the father of William Verelst (active in London 1732-56), who was probably the most accomplished portrait painter in the family. Simon Verelst joined the Guild of St Luke at The Hague in 1666 and in 1669 went to London, where he was visited on 11 April by Samuel Pepys, to whom he tried to sell a little flower-pott of his doing for 70. Verelst was certainly the finest flower painter to work in England until the arrival of Jean-Baptiste Monnoyer. In London he became the leading flower painter, but eventually took to calling himself the God of Flowers and was incarcerated in an asylum.